In concierge medicine, physicians develop amenities-rich membership programs and collect a monthly or annual membership fee to pay for the amenities in addition to the medical services rendered. Handbook of Concierge Medical Practice Design examines the many considerations physicians must make prior to transitioning their practices into concierge services. Maria K. Todd, a recognized expert in concierge medicine, branding, consulting, healthcare, marketing, medical tourism, planning, and physician practice administration,explains how to set up a concierge practice. She describes how this new business model affects workflow and outlines financial considerations—including managed care payer relations, the hybrid practice, and predictive modeling—to uncover the hidden factors that affect bottom-line performance. The book supplies readers with models for creating a business plan and a strategy for transforming a practice into a concierge practice. It concludes by covering the legal aspects of creating a concierge practice. It includes patient acquisition and retention strategies as well as detailed plans for adding additional doctors and physician extenders, such as nurse practitioners and physician assistants. The book provides sample employment contracts and advice on how to select and work with consultants. It includes chapters on business process re-engineering, workflow management, financial considerations, competitive analysis, developing a business plan, and how to market the new practice. After only working in traditional primary care for two and a half years post-residency, I already knew this was not the level of care or service I wanted to provide my patients. I'd already spent countless hours researching concierge medicine, but still had so many questions. Maria successfully guided me out of the fog and set me on a clear course to launch a successful concierge practice. I highly recommend her knowledge, expertise, and creativity to anyone interested in practicing concierge medicine. 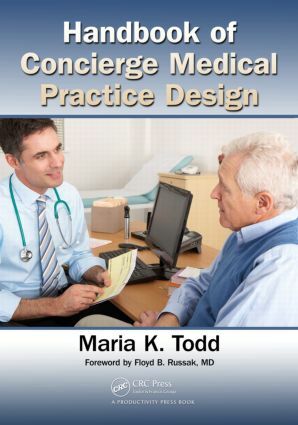 The Handbook of Concierge Medical Practice Design is a well-written, concise, and on-point guide for any practicing physician contemplating starting a concierge medical practice. Maria Todd has proven again why she is a leading expert in the areas of Concierge medicine, branding, consulting, health care, marketing, medical tourism, planning, and physician practice administration. She conveys her sincerest desire to see any physician wishing to pursue concierge medicine by the exercises she provides in the book. A highly recommended book. So glad we have a resource NOW, since Concierge Medicine and is growing at the rapid pace of 30 percent each year. A must-read for any physician thinking about converting or who has already converted their practice where it didn't quite work out like you planned. Competing with the chain drugstores for initial diagnosis, a concierge model is always a better answer, see Chapter 4 for more insight. Also look to Chapter 6 for more details on sorting out the financials. In Chapter 9, Maria goes into detail about what qualifications to look for when choosing an EXPERT who knows Concierge Medicine. Don't get caught up with big box conversion companies, as one size does not fit all. Look also to making sure telehealth and technology are part of the offerings, making sure the money a patient pays for the subscription gives them more or better service offerings. Chapters 8 and 13 give additional guidance about product design and what to offer because simply paying more for what patients are already getting doesn't fly! Will You Be Converting an Existing Practice? What Sets You Apart from Other Concierge Physicians? Exercise 5: My Role Models—Who Do I Admire? Defining Your Strategic Position: What Business Are You In? Really? Maria Todd is an award-winning and internationally respected healthcare business consultant. She frequently presents continuing education workshops, seminars, and keynote addresses for international, national, state, and regional healthcare organizations, investment firms, pharmaceutical and device manufacturers, and medical staff meetings. She has been consulting and managing medical groups in healthcare since shortly after graduation. She’s intimately familiar with the brand-building power of a successful marketing strategy and leading-edge innovation in healthcare. She built her first concierge medical practices and amenities-based practices internationally in the 1990s. They simply weren’t called concierge then; they were called private practices because the alternative was the public health, single-payer system. Maria often says, "If you wait long enough, you see things rotate back through again. I see cycles and recycles in healthcare (like independent practice associations [IPAs], and accountable care organizations [ACOs], for example). We’ll continue to see it until someone breaks the mold. Grab a hammer!" Maria is the author of several commercially published, peer-reviewed books on myriad topics in healthcare business management, including the industry’s top books on managed care, physician employment contracting, physician integration and alignment, medical tourism, and this latest title on concierge medicine. Her work is easily found on the Internet. Maria strives to be accessible to individual practitioners. She maintains a popular website that attracts more than 1,000 visitors a day and provides training through her website and private workshops and webinars. She blogs regularly at http://mercuryadvisorygroup.com, contributes actively on LinkedIn, and works one-on-one with clinicians across the country and throughout the world. Through her consulting firm, Mercury Advisory Group, she has been instrumental in building concierge medical practices, clinics, and hospitals throughout the United States and abroad. She also works on healthcare projects in the developing world, primarily in Asia and Africa. Her clients benefit from dozens of checklists, templates, and worksheets that can bring order out of the chaos that accompanies most concierge medicine transition and marketing/promotion projects.